Slemma is a data visualization software which allows to build automatically updating dashboards on your Freshdesk data. Slemma for Freshdesk is an analytical app for Freshdesk customers. 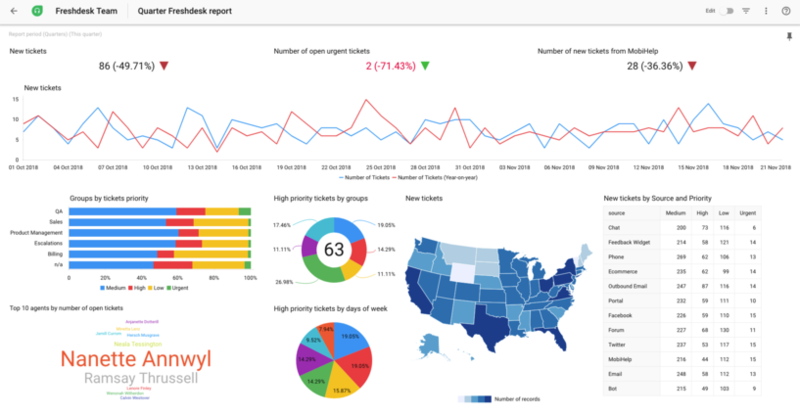 You can connect your Freshdesk data and use our easy-to-use chart builder to create automatically updating analytical dashboards. The Slemma and Freshdesk integration allows you to use your Freshdesk tickets information such as subject, type, status, the priority of the ticket,  time when the ticket was created, and other data to create your own fully customized dashboards. You can then share these dashboards with your team to make sure everyone has the information they need to make the best decisions. The goal of Slemma is to help your company become more data-driven and therefore, more competitive on the market. Analyze and track support tickets related to your accounts, view agent statistics, and team performance. This app needs you to have an account with Slemma. If you don't have an account, you can start a free 14-days trial (no card information required for the trial).